ISLAMABAD: Prime Minister Shahid Khaqan Abbasi has said that Pakistan won the war against terrorism, while rest of the world failed. “I am happy to say that we won where rest of the world failed,” the premier added before highlighting that Pakistan used its own resources and rendered sacrifices in the war against terror. The PM expressed these views while addressing the closing ceremony of International Counter-Terrorism Forum in Islamabad on Thursday. He praised the role played by the army, police, law enforcement agencies and the society who have contributed to the much safer Pakistan today. “Our largest city was amongst the top ten most dangerous cities of the world and today Karachi is safe and just faces street crime,” the prime minister added. The premier even shed light on how the economy is back on track and the results of China Pakistan Economic Corridor (CPEC) are visible. “If you look at the polling stations, the people of Pakistan have rejected radicalisation always,” he remarked. He informed the audience that the country has countered extremism by developing a public religious stance on terrorism. “For the first time over 1,800 ulemas of all sects got together and issued a fatwa on the meaning of jihad and against the concept of suicide bombing,” he stated. When talking about Afghanistan, the premier said that Pakistan stands for peace in Afghanistan as war is not the solution. He later condoned the international narrative on Afghanistan and reiterated that peace in Afghanistan can only come with dialogue. “The people instigating terror in Pakistan are sitting in Afghanistan,” he concluded. The prime minister referred to the cold-blooded killing of 17 people in Occupied Kashmir and innocent children in Kunduz in Afghanistan and said such incidents breed extremism and radicalism. 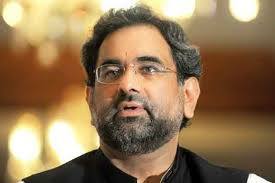 Abbasi drew attention of the world towards freedom struggle of Kashmiris and said the issue of Kashmir can only be resolved through implementation of UN Security Council resolution. He said Pakistan does not ask for more than that the international community should accept what is happening in Occupied Kashmir. Earlier, Foreign Minister Khawaja Asif had remarked that it is the need of the hour to work towards sustainable development. While speaking at the final day of the International Counter-Terrorism Forum in Islamabad, he urged that there is a dire need to invest in human resources. The foreign minister further said that Pakistan’s success against the menace of terrorism is helping the country realise its vision of democracy. He remarked that the whole nation stands united in the fight against terrorism. Asif said Pakistan has been a major victim of terrorism. “Terrorists are trying to undermine our sovereignty and no country can ignore attacks on its territorial integrity,” he added. Khawaja Muhammad Asif said, “Our forces have offered unprecedented sacrifices to defend the motherland and they are ready to offer more sacrifices for the country.” He added that the nation has an unwavering resolve to eliminate terrorism. He asserted that democracy is essential for the country. “Democracy gives us freedom of expression as well as social and economic rights,” he said, adding it is the democratic system which led to the drafting of Constitution. Addressing the conference, Interior Minister Ahsan Iqbal said that blame game won’t help eliminate terrorism. The interior minister stressed the need to understand ground realities in the war on terror. Despite constraints, he said, Pakistan played an effective role against terrorists and moving towards its destination. Terrorism was the biggest challenge for the young generation, he said, adding that security forces, politicians, students and other departments concerned actively participated in counter-terrorism measures. The Pakistan Muslim League-Nawaz (PML-N) leader said that Pakistan and China were trying to increase regional cooperation and progress through the CPEC. He said that the forum was aimed at highlighting gains in the war against terrorism. He hoped that the nation would continue its journey with unity.